I was lucky enough to have always lived in a first floor apartment in the city of Montreal. So I’ve always have a small garden to grow some lettuce, green onions, basil, tomatoes, pepper and little more. So when someone talked to me about this article, I thought I should share and maybe it could inspire some. 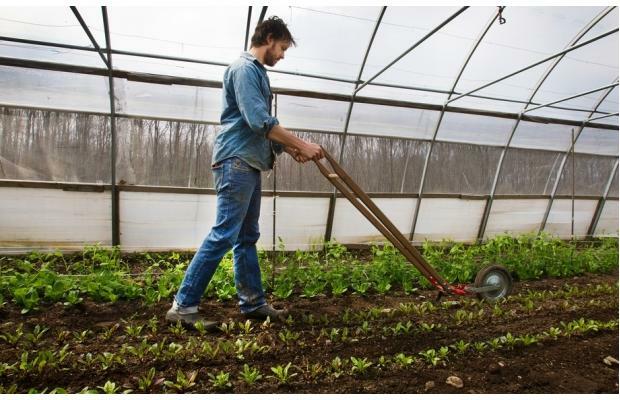 This article was published in the Gazette about small Farmers in Québec, on the May 16, 2014. Today, even big stores like Loblaws and Metro are now carrying free range meat they say is raised with no antibiotics, as well as organic fruit and vegetables, albeit from beyond our borders. But the big story, in lockstep with the farm-to-table movement, is the new life on Quebec’s small farms. We are also meeting Jean-Marie Fortier (in the picture above), from Les Jardins de la Grelinette in St-Armand, who only uses hand held tools to work his field, “People are super stoked hearing that young people make a living on an acre and a half without a tractor,” he says. The movement toward small, organic farming is so strong, Thériault says, that many farmers can’t accept more customers for their CSAs. But that doesn’t mean all new farmers will be successful. Would you decide to make a change and become a farmer ? When buying your vegetable, do you know where they came from ? Are you trying to eat fresh and organic food ? What do you think of GMO ?